This is video of Miss Abby during therapy this week. I would love to try to get her into an extensive therapy program but she is just not strong enough..and quite frankly a bit lazy...Not from her disorder but from being spoiled rotten. We are trying to focus on stregthining her core and back since her scoliosis diagnosis. I have seen a difference in her strength at home. For a while there she was not able to sit up on her own without support for any length at time. She almost always falls and or leans to the right. At last check she had an S curve at 13 degrees at the top and 20 at the bottom. We are praying that there is at the very least no further curve and maybe some improvement. Hey all. I want to tell you all about our friend Daphni Jo. She is a beautiful girl that lives in Cle Elum Washington. Daphni is 8 years old and is such a wonderful child. Like Abby she is also living with Rett Syndrome. 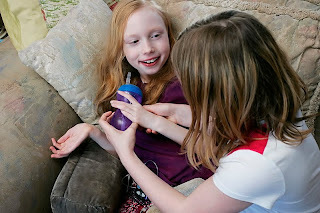 On top of the daily challenges of that she has Diabetes and has to wear an insulin pump. In the last few months her seizures have been coming more and more often. A few months later I met her Mom..Jerimarie online and we became friends. We met the next year in person and this family is just so amazing. Daphni's Mother and I just may have been separated at birth. In the last few months they have really been struggling with Daphni's safety. Her bed broke. Daphni has seizures and Mom and Dad have spent many a sleepless night watching over her. The one thing that gets recommended when your daughter is diagnosed is to get a Sleepsafe bed. Easier said then done. They run between 5 and 8 thousand dollars. I know that we personally have asked 2 wish foundations and the Love fund and have been denied. The Sleepsafe Bed has special sides and a special mattress and is able to go up and down either by hand crank or fully electric. It may seem like a big expense for a layman but they really arn't much more than a hosptial bed and 10 times as safe. When you have a child who can't speak or call out to you..that can't say Mom or Dad or even help their safety is so so important. If Daphni were to wiggle out of bed by accident or seizure she could suffer great harm. And her mother has to live with this every night. The Cle Elum community is putting on a fundraiser for Daphni Jo to try to raise the funds to get her this bed. My request is that anyone who is willing to donate do so. I am so far away or Id be right there doing everything I could. You just have to log in to your own paypal account and enter that address as the payment to. Thank you all so much. Let's get Daphni this bed! Murphy's Law was all over us this morning and we had to cancel Abby's Physical Therapy appointment...Snowing to beat the band and neither one of is feeling too woopie. We have never missed a therapy appointment. We did take a couple of videos last week. To someone not involved in the world of Rett these may seem very so what to you. For those of us that live it these are jump for joy moments. Since Abby was down last year for so many months she lost almost all of her core strength and walking ability. She can no longer walk more than a few feet without assistance. Above she is working on leg strength and climbing the stairs on her own. You will be able to see how very hard it is for her brain and body to work together..especially when she attempts to walk down. Because of her severe vertigo and no center of gravity there is no down stepping for Abby so far...we hope to change that or at least hang on to what we can and fight this Rett Syndrome Monster any way we can. The video below was also taken last week. Working on a swing for a child who has such extreme hypotonia and no purposeful hand use has been challenging but she is working super hard and we are so thrilled that she can hang on at all now. She is such a little toughie and I am so proud of her!